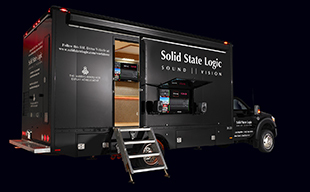 OXFORD ENGLAND - Solid State Logic is extremely proud to announce a further evolution of its Live console range with the release of SSL Live L350 and L550 consoles; the most powerful, no-compromise, SSL Live consoles to date. Alongside these new consoles comes X-Light; the next generation of touring-grade high bandwidth Dante AoIP infrastructure technology, a new Stagebox and new V4.8 software. X-Light is a high channel count, ultra-low latency interface, carrying 256x256 channels of 96 kHz 24-bit audio plus control data between SSL Live consoles and Dante devices on stage via a single cable. Featuring ruggedised connectors and cable redundancy, X-Light has been designed to offer a Dante I/O solution that is reliable and quick to deploy in the field, while maintaining many of the benefits of a scalable and flexible AoIP network. X-Light establishes SSL Live as the first live sound console with enough Dante I/O to handle stage inputs for mid to large scale touring applications. With SSL Live, users are not limited to 64 Dante channels or a 48 kHz sample rate. 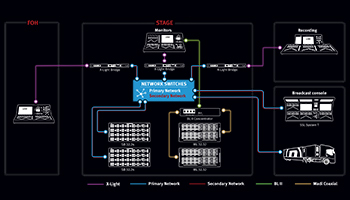 New L350 and L550 consoles can be specified with X-Light and SSL Blacklight II connections. The X-Light option can be fitted to any L100, L200, L350 or L550 console. Owners of L300 and L500 consoles can upgrade to L350/L550 to take advantage of X-Light. For the touring market, a new 1U X-Light Bridge interface designed to be deployed within stage I/O racks, features a fully redundant pair of X-Light connections using Neutrik opticalCON Quad format connectors on the front panel. On the rear panel there are two redundant pairs of Neutrik etherCON format Dante connections for audio and control distribution. Up to eight SB 32.24 stageboxes can now be connected via a pair of network switches to a single X-Light Bridge redundantly at 96 kHz with gain control of each input. There are no big workflow changes either! X-Light Bridge provides a seamless I/O boost for the user, as the routing process in the console interface is exactly the same via the X-Light Bridge as it is via the existing local Dante Expander Module. This includes the ability to configure the X-Light channel capacity as Virtual Tie Lines, for routing in Dante Controller, or as Dual Domain Routes for seamless routing and control from console channels. SSL is also further expanding the SSL Network I/O range of Dante interfaces with the introduction of the SB16.12 Stagebox. Based on the same specifications and design as the llarger SB32.24, the new SB16.12 features 16 SuperAnalogue™ mic/line inputs with gain compensated digital split outputs, 8 line outputs, 4 AES inputs with SRC and 4 AES outputs. The SB 16.12 has dual Dante network interfaces, providing a redundant pair of ruggedised etherCON ports for the main I/O and a redundant pair of SFP ports for the compensated split outputs. The SFP ports can be configured by the user with RJ45, multimode fibre or singlemode fibre connections. The two networks can be linked to allow access to all I/O and ports on a single (redundant) network, or split to provide network segregation for the split outputs (e.g. to feed a broadcast truck). The SB 16.12 allows for greater flexibility of I/O options when deploying I/O in a distributed system. SSL Live 350, L550 consoles, X-Light Bridge, SB 16.12 Stageboxes and new V4.8 software are all available from Feb 2019.